Some like it hot; some like it hotter. Chili pepper growers that enjoy a bit of heat will certainly get what they ask for when growing ghost peppers. 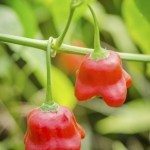 Keep reading to learn more about these HOT pepper plants. Ghost pepper plants, otherwise known as Bhut Jolokia, are a type of hot pepper plant grown in India. I used to think that habanero peppers were spicy at a Scoville heat unit measure of 250,000 units, but now that I know of the ghost pepper and its Scoville rating of 1,001,304 units, I shudder to think what it might do to my gastric system. In fact, the fruit from a ghost chili pepper variety called Trinidad Moruga Scorpion has been recorded as the world’s hottest pepper in the Guinness Book of World Records. In India, ghost peppers are used as a medicine for stomach ailments and eaten to cool the body by inducing perspiration during the hot summer months. Really! Ghost pepper plants are also spread on fences to repel elephants — and I suppose any other creature that is likely to attempt a crossing. More recently, another use has been discovered for growing ghost peppers. In 2009, scientists in India suggested the peppers could be utilized as weapons, in hand grenades or as a pepper spray, with a resulting temporary paralysis but no permanent damage to terrorists or invaders. Ghost pepper plants are quite possibly the next environmentally friendly, non-lethal weapon. Growing ghost peppers is difficult compared to other hot peppers due to their requirements for a certain amount of humidity and heat, which is in direct relation to their heat index. In order to best grow these peppers, your climate should most closely match that of their native India, which has five months of intensely high humidity and temperatures. If your growing season is short, the ghost pepper plants can be moved indoors in the evening; however, these plants are sensitive to shifts in their environments and a lot of moving around may damage the plants irreparably. The surest way of growing ghost peppers is indoors or in a greenhouse where temperatures can be maintained at the 75 F. (24 C.). Seeds for ghost peppers take around 35 days to germinate in very warm soil between 80-90 F. (27-32 C.) while keeping the soil moist consistently. Soak the seeds in hydrogen peroxide for a minute to increase germination success, and use full sun fluorescent light bulbs to maintain temperature and humidity. Sensitive to over fertilization, changes in temperature and other environmental stressors, ghost pepper plants must have a growing season of longer than three months in temperatures of above 70 F. (21 C.) in order to be grown outside. If growing ghost peppers in containers, use a well-draining potting medium. Growing peppers in the garden may need to have organic matter added to the soil, especially if the soil in sandy. Fertilize the newly planted ghost pepper plants, and then two or three more times during the growing season. Alternatively, use a controlled release fertilizer to feed during the whole growing season. And lastly in the care of ghost chili peppers, maintain a regular watering regime to avoid shocking the delicate peppers. To be on the safe side when harvesting ghost peppers, you might want to wear gloves to prevent any burns from the peppers. Harvest when the fruit is firm and brilliantly colored. If you are seriously tempted to eat ghost peppers, again, be sure to wear disposable gloves when preparing and only take a tiny bite at first to test your ability to handle the hottest pepper in the world.